A Shambhala environment is a physical space that is sacred: sacredness is the foundational principle of Shambhala culture and our built environment. 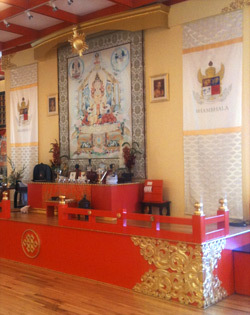 A Shambhala sacred space is one in which innate goodness is mature and fully manifest – visible and palpable. We call the strength of basic goodness drala. A Shambhala environment is a physical space that is spiritually imbued, impregnated with the spiritual presence of drala, basic goodness shining out. We cultivate drala in our environments to empower daily living. We call the teachings on Shambhala environments container principle. The container is the physical environment of sacred space. A Shambhalian container is an environment that “nurtures the waking state of mind of the student Warrior”. (The Druk Sakyong) The container is a direct embodiment of the teacher and the teachings: the world, seen from ‘awake’. Like being in the presence the Lineage, our environments are not always comfortable in the conventional sense, requiring that we raise our head and shoulders to meet them. But they are comfortable in the uniquely Shambhalian sense that they restore our genuineness. Sacred architecture is the embodiment of intrinsic sacredness and the method we use to create the container. The purpose of sacred architecture in Shambhala is to facilitate the spiritual journey and to empower the Lineage and transmissions. The forte of sacred architecture is the cultivation of the transformational potential of the built environment. Sacred architecture cultivates drala in the external environment in order to awaken our inner drala. Our primary prototype for sacred space is derived from our central deities Shiwa Okar and Rigden; and the Three Courts, the mandala principle of Shambhala. We design architecture following their iconography, using form to ‘capture alive’ the intangible but palpable energetic and transcendent transmissions. Space creates mind, enlightened form triggering realization. Whether one room or an entire complex, we follow the pattern language of the Three Courts in the design of built space. All of our facilities are sacred buildings: in Shambhala spiritual and secular are inseparable. A Shambhalian container integrates formal practice space with enhanced facilities that empower the sacred secular rituals of a lay warrior Society. We gather as family and clan to celebrate and soak, being the Kingdom. Sacred architecture brings spiritual vision into temporal embodiment in a drala culture – unifying heaven and earth. Our container is a physical vessel that allows the teachings to take root. We use sacred architecture to stabilize the manifestation of Shambhala vision, Lineage and Society through transcendent environment.